The castration of male pigs is a very old and common procedure that was probably carried out in order to produce both calmer and fatter pigs. Archaeological evidence of the castration of pigs has been found from 4000-3000 BC (Steen, 2004). "In our part of the world people cut out the testicles of young pigs and oxen, but not for the same purpose; rather, those of the pigs for the sake of eating (for the flesh of castrated pigs is also more tasty, more nutritious and better to cook), and those of oxen for their usefulness in farming (for bulls are difficult for them to manage). But they remove the testicles of goats and sheep for both reasons". The boar taint problem described above has historically been an additional reason for the castration of male pigs. 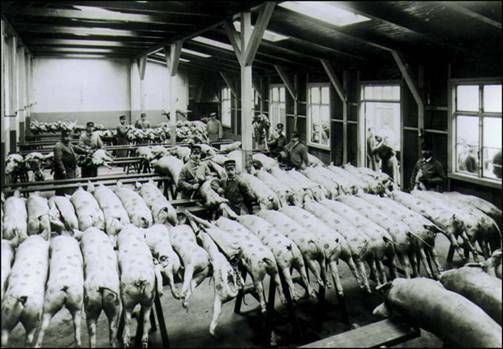 The production of pig carcasses for the UK market. Source: Swedish Veterinary History Museum. In recent years there has been a general tendency to increase carcass weights in most European countries. This rise in slaughter weight is likely to result in an increased incidence of boar taint in entire male pigs (EFSA, 2004).